Wales-based security solutions manufacturer, Morgan Marine, continues its expansion drive with the unveiling of a new extension at its key headquarters in Carmarthenshire. 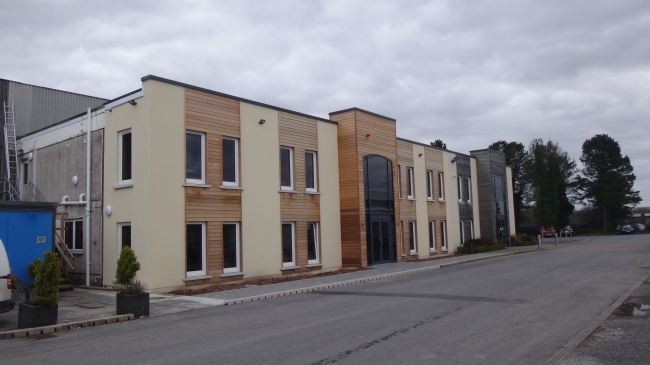 The extension gives the Llandybïe firm an extra 102 square metres of office and meeting space and it will allow them to create eight new jobs. Morgan Marine, a £24 million-turnover company which makes advanced glass reinforced plastic (GRP) housings and enclosures for the utilities, construction, rail and nuclear sectors, is a key employer in South West Wales employing, almost 250 staff. Group Director, Martyn Ingram, said: “We are delighted to unveil our new extension, which will enable us to further expand our operations by accommodating additional sales and engineering staff – four in year one and a further four in year two. This extension, which was carried out by a Llandybïe contractor, JO Morris Ltd and part-funded by the Carmarthenshire Rural Enterprise Fund, comes hot on the heels of the installation, company-wide, of a £1 million Enterprise Resource Planning system, to integrate all systems and operations across the company’s Carmarthenshire and Swansea sites. Back in 2015 Morgan Marine unveiled the first phase of its extension plans at its Llandybie headquarters, which was opened by HRH The Prince of Wales. The additional extension brings the total investment to around £1 million.